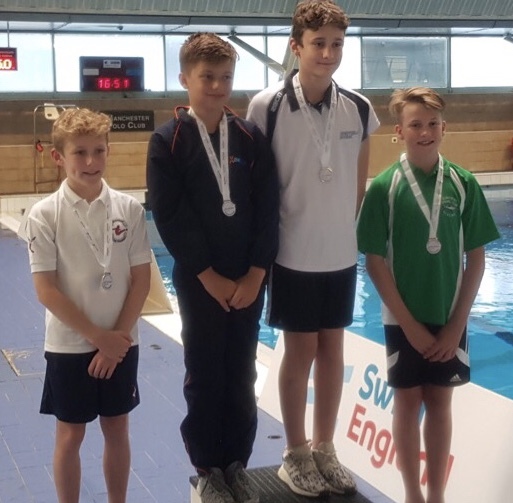 Swim England National Skills Finals is the culmination of a year’s preparation and hard work for our Level two divers and their coaches; Bernie Bicknell, Chris Beal and Matt Pipe. Skills competitions are the first level in National Competitive Diving and have been designed to test core skills from the poolside, 1m springboard and 3m springboard. Divers are tested on the ‘rip’ they perform their controlled take-offs and technical precision. Standards at the National final are extremely high and a podium placing is a significant achievement. Diving in boys C2 (13 yrs.) Aiden Jones completed a set of required skills from poolside and the 1m and 3m springboards. 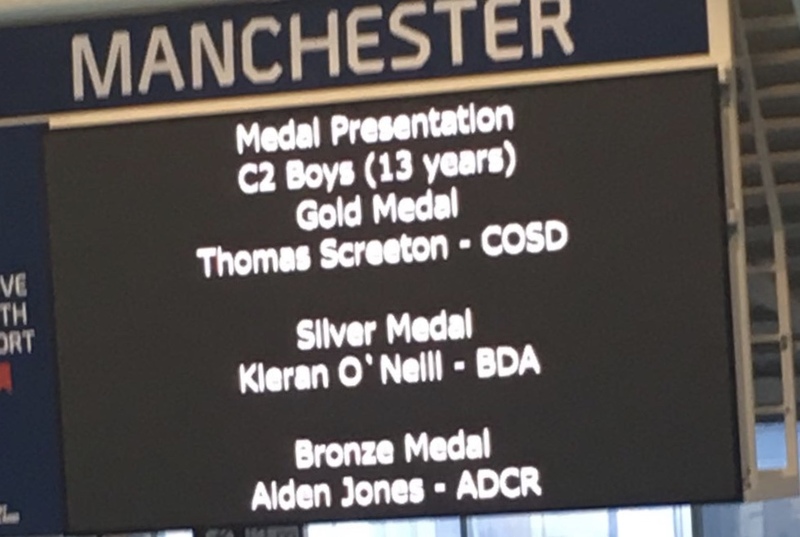 Consistent high quality work across all stations, with many dives scoring 7 or better, added to Aiden’s final score of 274.70 points and the bronze medal. On 3m Aiden impressed with a strong line up set with many rip entries. Aiden maintained his high standard on 1m where he executed an excellent, well-controlled, back dive tuck for 31.50 points and on poolside where quality in his back skill was awarded an 8! Austin Bradbury was in the younger boys C1 (12 yrs.) event. Austin delivered consistent line ups from 3m and demonstrated his power and strength in backward skills on 1m and poolside. Austin scored 7.5s for his back press on the 1m board and 8s for his poolside back jump tuck to finish 12th. B+ (14-16 yrs.) divers perform a set of dives from the 1m and 3m springboards. 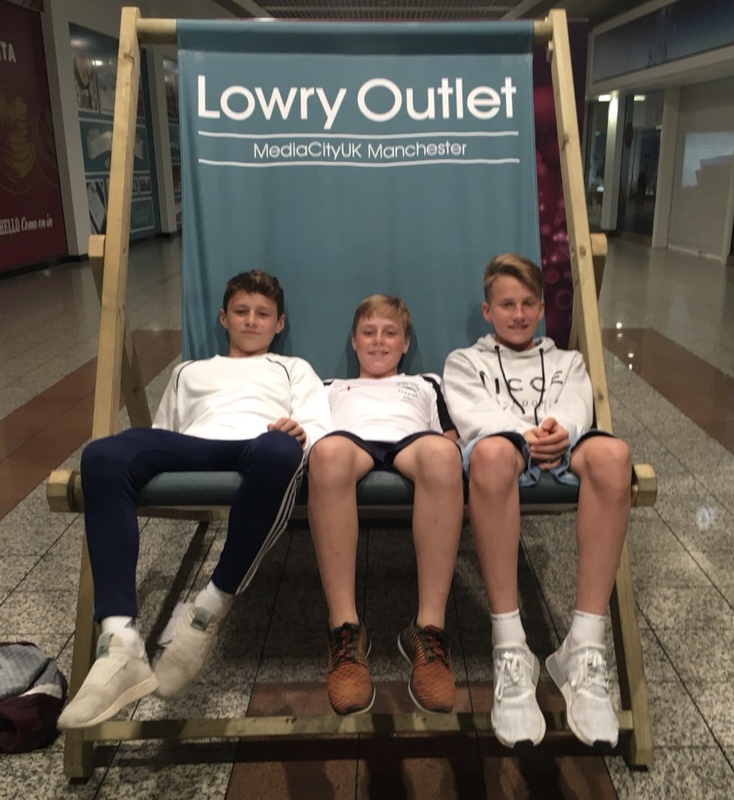 Amber Cowen, Zac Cooper and Harry Healey were all competing. Zac Cooper led the older Albatross divers where strong 1m work including a reverse dive tuck (31.20 pts) and forward one and a half somersault pike (30.60 pts) contributed to Zac’s final score of 276.75 and 11th place. 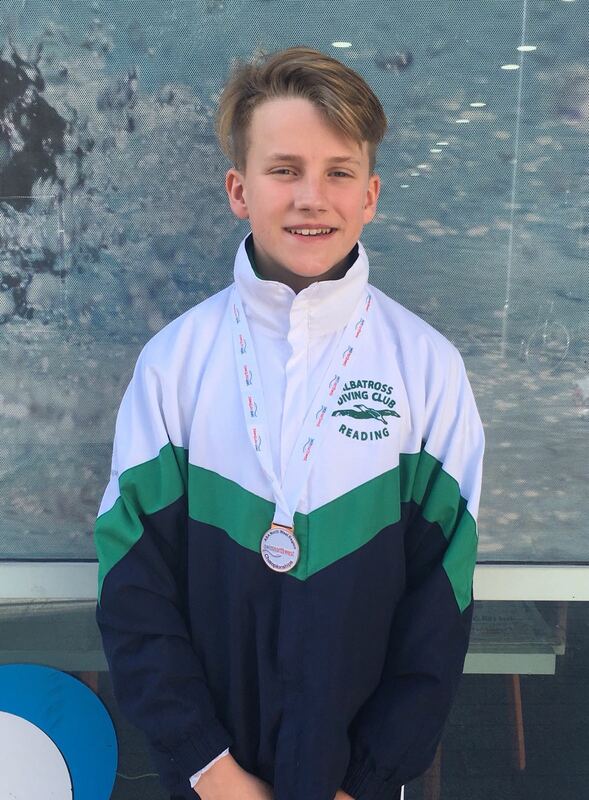 Harry Healey also showed his strength on 1m scoring well on his inward dive pike (27 pts) and forward one and a half somersault pike (31.45 pts) to finish in 15th with a final score of 259.30. Amber Cowen competing in girl’s B+ dived exceptionally well to finish 9th out of a field of 26 with a personal best of 271.05 points . Amber shone in her 1m work scoring 7’s for her back dive pike (34.40 pts.) and inward pike dive (29.25 pts.). Amber also demonstrated technique and control in her forward one and a half somersault pike (31.45 pts.) and forward single somersault one twist (30.40 pts.). Coaches were extremely pleased with the performance of all skills divers and look forward to building on this National achievement during the coming season. Sadly Aiden Jones is retiring from diving to concentrate on his other aquatic sport which is water polo! Albatross divers and coaches wish Aiden every success.